Nutritional disorder – calcium (Ca) deficiency. Calcium (Ca) is essential for proper plant development and leaf expansion. 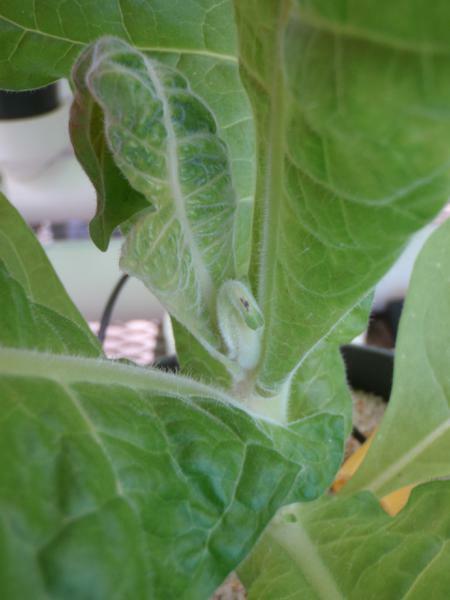 A calcium deficiency will first manifest in the youngest foliage because calcium is an immobile element within the plant. As calcium deficiency progresses, the developmental damages will also advance. 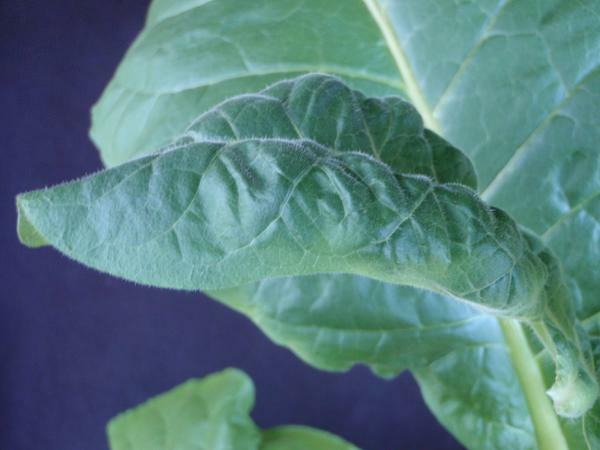 The integral role of calcium in leaf development makes its early diagnosis vital to tobacco production. 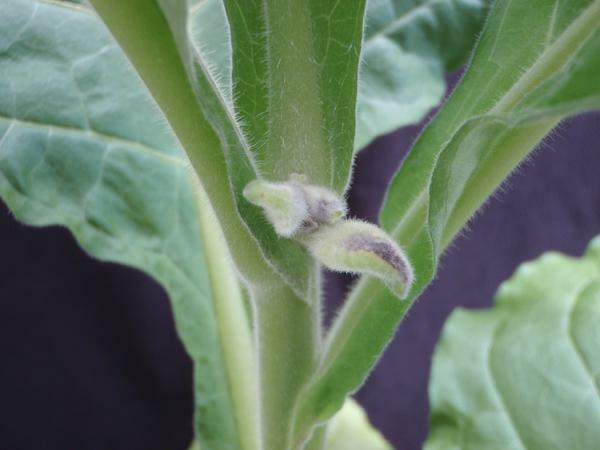 Early calcium stress in tobacco first manifests in the new foliage. The initial symptom is a marginal yellowing of the new foliage (Figure 1). This quickly progresses to death of those cells along the leaf margin. Because these dead cells fail to expand, the topical symptoms will result in a curling of the new leaves (Figure 2). This shepherd’s crook appearance of the new, expanding leaf is an early sign a tobacco plant is not receiving enough calcium. Deficiencies may occur even if there is adequate calcium in the soil due to the plant’s inability to take up calcium from the soil due to excessive drought or water logged conditions. As calcium continues to be limited, this curled edge will show signs of deformation and necrosis (Figure 3). Ultimately, if calcium is not provided to the plant, advanced symptomology will result. In addition to further deformation of the new foliage, the growing tip will die (Figure 4). This death will stunt the plant’s growth and result in the proliferation of axillary shoot (sucker) growth. Root growth is also inhibited. Figure 1. Initial Ca deficiency in the new foliage. Note the shepherd crook, or downward curving shape of the expanding leaf. Figure 2. Intermediate Ca deficiency symptoms. Note the yellowing on the leaf margin. Figure 3. Intermediate Ca deficiency. Here both leaf deformation (tearing) and necrosis are present. Figure 4. Advanced Ca starvation will result in the death of the growing tips, note the darker, spongy appearance of the terminal buds. Boron deficiency also results in distorted leaf symptoms, but in the case of limited B, the leaves are also thicker and axillary shoot proliferation also occurs. Drift or carryover of auxin mimicking herbicides, such as 2,4-D, Aminopyralid, Dicamba, or Picloram, can produce injury symptoms similar to those expressed by calcium deficiency. Tissue analysis for nutritional concentration and/or pesticide residues can assist with correct diagnosis. Good root systems and environmental conditions that encourage evapo-transpiration through the leaves will aid in the uptake of calcium (and boron). Leaf edge burn and puckering helps to distinguish this disorder from boron deficiency which results in distorted and thicker leaves. Submit a leaf sample for nutrient analysis. 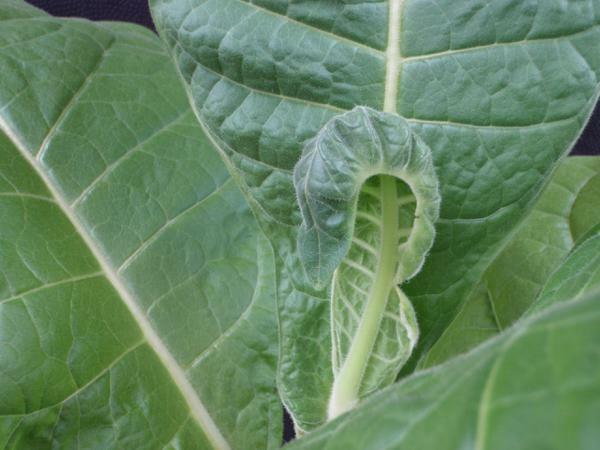 The sufficiency range for calcium in tobacco is 0.75% to >1.5 %, depending upon stalk position and growth stage. Values lower than 0.75 % are considered deficient. There are no published recommendations for excessive calcium levels. Once calcium deficiency is confirmed, additional foliar or soil applications containing calcium fertilizers have not shown to be of great benefit. In fact, research has shown that foliar applications of calcium may result in leaf phytotoxicy (burn). In addition, the use of calcium chloride foliar sprays should be avoid due to the potential of the chloride imparting off flavors to the tobacco. Most often, it is the practice of early topping that prevents or reduces the effects of calcium deficiency. Early topping has been shown to stimulate root growth by as much as 40%, thus allowing for greater root exposure to various nutrients found within the soil profile. This practice will also divert the flow of nutrients and photosynthates to leaf growth instead of flower and seed development. Conduct a soil test prior to planting the crop to determine if pre-plant fertilizer applications of calcium are required. Recommendations vary by soil type and your location, so check with local resources for guidelines. When the soil is maintained at the recommended pH for tobacco, calcium levels are almost always adequate for plant growth. In most instances, Ca deficiencies occur when environmental conditions limit calcium uptake by the plant, even when soil calcium levels are adequate. Calcium and magnesium (dolomitic lime). If soil pH is kept within the desirable range of 5.8 to 6.2 with dolomitic limestone, the available levels of calcium and magnesium will usually be high enough to meet the needs of the crop. Otherwise, 40 to 50 pounds of calcium (Ca) per acre are needed from the N-P-K fertilizer. However, using N-P-K fertilizers containing calcium and magnesium will not substitute for using dolomitic lime if soil pH is too low. Be especially aware of low soil pH. The latest soil test summaries from North Carolina show that just over 25 percent of the tobacco fields tested in the last several years have had a pH lower than 5.5, with piedmont soils generally being more acidic than those in the coastal plain. Calcium deficiencies are sometimes observed in North Carolina across a wide range of soil types and growing conditions, although they are more common during periods of rapid plant growth and are more typically observed near topping. Calcium is not mobile within the plant, and as a result, deficiency is most often observed in younger leaves. Producers should be aware that calcium deficiencies are transient and will often disappear after topping occurs. When topping occurs, most of the affected tissue is removed from the plant. Furthermore, topping stimulates additional root growth which can promote additional calcium uptake from the soil. Research in North Carolina has demonstrated that applications of calcium beyond what is applied through liming materials does not improve calcium uptake by the plant; therefore, foliar applications of calcium are not recommended during the season. In a study conducted during the 2015 growing season, liquid calcium was applied through foliar applications at rates supplying as much as 50 pounds calcium per acre. In this study leaf yield was not increased with the addition of calcium. Furthermore, severe leaf injury was observed where calcium was applied due to high salt content within the solution.